Two opposing draft resolutions: a French-Spanish version and the other by Russia, on Saturday failed to be approved by the UN Security Council in response to the current situation in Syria. The first one, drafted by France and Spain, was vetoed by Russia, a permanent council member, while the Moscow-sponsored draft failed to gain nine votes in favor, the minimum of supporting votes required for a draft to be adopted by the 15-nation UN council, instead gaining nine votes against. 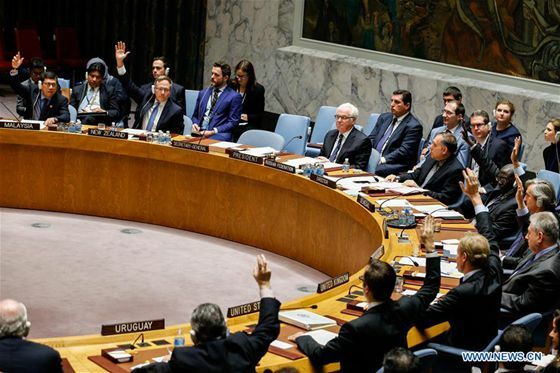 The back-to-back votes took place during an unusual Saturday emergency meeting of the UN Security Council. The French draft presented to members a few days ago called for efforts to ground Russian and Syrian military planes over the northern Syrian city of Aleppo. The Russian draft offered Friday evening included many elements of the first draft, added support to references of a Sept. 9 Russia-U.S. accord and prioritized separation of armed opposition groups from the Al Nusra terrorist group but excluded the no-fly zone proposal. Ambassador Vitaly Churkin of Russia, this month's president of the Security Council, speaking in his national capacity after it was defeated, said, "We were not expecting it to be adopted. It was just a political demonstration, if you like." "While it wasn't implement -- while we think it could have been -- I'd like to reassure you that very complicated multilateral and bilateral work is ongoing and we do continue to hope that the situation in Syria will go back to normal and this would have a most beneficial affect on the situation in eastern Aleppo and we hope that happens as quickly as possible," he said. It was another testy session of the council, normally a model of decorum. "Normally I begin my statements in this Council with the words 'Thank you, Mr. President.' I cannot do that today," said British Ambassador Matthew Rycroft, opening his remarks after the first resolution failed to be adopted. "Because today, we have seen the fifth veto in five years on Syria from you, Mr. President, a veto that has once again stopped this Council from creating the unity needed to give the people of Syria any hope for respite from their suffering, a veto that has once again denigrated the credibility and respect of the Security Council in the eyes of the world," " Rycroft said. "A veto that is a cynical abuse of the privileges and responsibilities of permanent membership, and I simply cannot thank you for that," the London envoy said. "China has been concerned with the recent escalation of the situation in Syria," said Liu Jieyi, the Chinese permanent representative to the United Nations. "We feel deeply the sufferings caused by the war to the people in Syria. China strongly condemns all terrorist activities that harm and kill innocent lives." China abstained from the Franco-Spanish draft and voted for the Russian version. While his nation approved of many items in the France/Spain draft, "some of the content in the draft resolution does not reflect full respect for the sovereignty, unification and territorial integrity of Syria" and "constructive views of some council members have not been incorporated, so China has to abstain in the vote." "As the Russian draft called on all the parties to cease hostilities and open humanitarian access to enhance efforts to combat terrorism, to support the good office of (Special Envoy Staffan) de Mistura and called for an early resumption of peace talks in Geneva," Liu said. "The draft resolution reflected the four-track idea -- ceasefire, humanitarian assistance, joint efforts to combat terrorism and political negotiations," he said. "It also reflected the full respect for the sovereignty, independence, unification and territorial integrity of Syria, with content that is comprehensive and balanced." "China hopes that the Security Council will really take the safety of the Syrian people as the first priority and stay united and build up consensus and to continue the efforts to push for a political solution of the question of Syria to jointly work to prevent the expansion and spread of terrorism and play a constructive role in maintaining peace and stability in Syria and the region," Liu said. Ambassador Bashar Ja'afari of Syria spoke after all other speakers, and at a greater length than of any, in support of the Russian resolution, it's ally in the aerial bombardment of eastern Aleppo to flush out anti-government forces. Noting that several western diplomats had left the chamber he said they departed "when they heard words of truth spoken," Ja'afari said. "It proves they have malicious, colonial intentions against my country and the people of Syria and that their diplomacy is a diplomacy of chaos, coercion and use of force and not a diplomacy of dialogue and resolving conflict by peaceful means." The UN Security Council on Saturday failed to adopt rival resolutions on Syria as the council' s key powers divided over how to solve the conflict in Syria' s northern city of Aleppo.